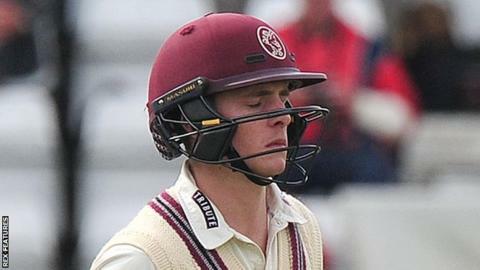 Ian Holland took 4-16 as Somerset collapsed, losing seven wickets for 33 runs against Hampshire on day three. Resuming on 43-1 after there was no play in the first session, debutant Eddie Byrom (43) and Adam Hose (48) put on 77 to take the score to 102-1. But Holland then dismissed Byrom, James Hildreth, Tom Abell and Steven Davies in a remarkable four-over spell of 4-8. He ran out Lewis Gregory before Gareth Berg (3-26) claimed two wickets, then rain forced an early close at 135-8. Somerset came into the day in a commanding position, having triggered a similar collapse from Hampshire with the pink ball under the floodlights in their first innings. However, the poor middle-order batting that has undermined their County Championship season came back to haunt them, meaning a first win of the season is now very unlikely. Opener Byrom, who had looked otherwise solid, chipped USA-born Australian Holland to mid-on and Hildreth went lbw for two before Abell and Davies feathered edges to Lewis McManus, both without scoring. Gregory was run out by Holland when he slipped trying to run a quick single, leaving Berg to pin Hose lbw and have Craig Overton caught at mid-wicket before rain prevented any play in the final session. "It was a strange session of cricket. Obviously they had the momentum early and they got a decent partnership but we got a load of wickets in a hurry, so it's a decent end for us. "It puts us in a strong position. You never know. There are still 96 overs, maybe more, left in the game. "It is nice to contribute and come in and do well. I don't want to come in and be deadweight. The pink ball has been good to me. It seems to do bits in periods of the game and then flatten out. You are never out of the game." "It was so good to see Adam Hose and Eddie Byrom batting well and getting into a good position, then Holland came on and nipped it around under the lights and caused problems. "It was nibbling a little bit more. When you come in under those conditions it is tricky. He had a couple of decent balls out there. None of our boys gave their wicket away. "Eddie Byrom has impressed full stop. I liked the look of him in the academy and he is now getting his game. He knows his strengths in this form of the game and he showed that with the balls he left. I feel chuffed for the lad."